Whether you missed an issue or are looking for extra copies of a certain edition, past issues of Andiamo! are available! Past issues are $3.00 each and are limited based on supply. 2. Fill in your mailing address and information, including the issues and quantity of each you desire. 3. 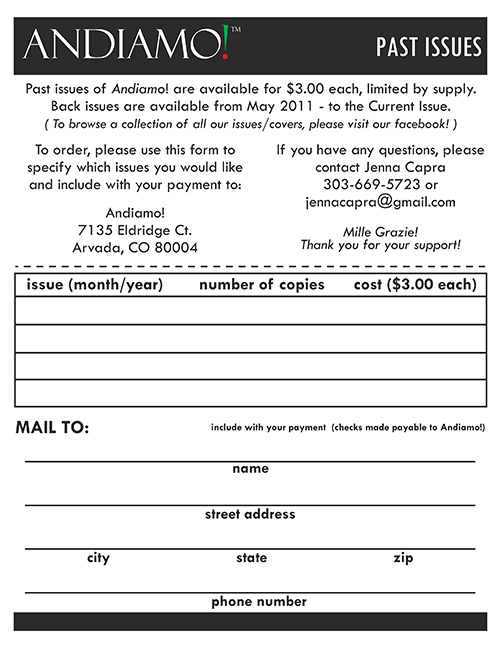 Total your purchase and send in the form with payment to Andiamo! at the address provided! • January - Lemons to Limoncello • February - All That Glitters • March - World-Class Women • April - Italian By Association • May - Italy's Wild Side • June - Golf • July - Speeding into Summer • August - Innamorato di Amalfi • September - Law & Order • October - Heritage Month • November - Giving Thanks • December - Buon Natale!